The setting: medieval Transylvania. Several hundred years have passed since legendary hero Simon Belmont defeated the evil Count Dracula and sealed him away for what was supposed to be eternity. The people have long forgotten about the horror of the undead, thus allowing a few depraved individuals to restore the Prince of Darkness to his former state; sleeping in his coffin by day and preying upon hapless victims by night. Dracula now plans to get revenge on his old enemy through his descendants by locking Annet, the girlfriend of Belmont's great-grandson, Richter, and her sister, Maria, in his dark gloomy castle. --From the SNES Castlevania Dracula X instruction manual. Play Castlevania Dracula X Now! Castlevania Dracula X was a great addition to the Castlevania series. The graphics were a great deal better than that of Castlevania 4. Most of the bosses are new and harder to beat. You get to go up against a werewolf, a huge knight with an equally large lance, and a two headed panther, forgoing the typical Medusa, Frankenstein, and Grim Reaper. I don't think this game is quite as difficult as the original Castlevania, but it is still quite hard to beat. I don't think I could have done it without cheating. Unfortunately, for Dracula X they got rid of the special weapon having its own button, and the ability to throw your whip in any direction. For the special weapon, Konami went with the old "push up and attack at the same time" routine from the earlier games. The jump ability was improved, though. You can change directions in mid air this time, and you can jump onto and off of stairs. 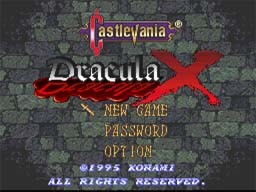 If you are in the mood for some good old Castlevania action, load up Castlevania Dracula X and have at it! This addition to the Castlevania series plays muck like its predecessors. It's a platformer that you must fight your way through, only to meet up with a boss at the end. After you defeat the boss, your life will be refilled and you will start the next level. You start with three men and you may find one-ups in candles and secret blocks you can destroy with your whip. Candles also may hold hearts. Hearts give you the ability to use your secondary weapon. A small heart gives you one and a large one gives you five. Candles can also contain a cross pendant that will destroy all enemies on the screen. Meat that restores life may also be found in candles. A key can also be found that will open one locked door. You may also find a potion that will make you invincible for a short period of time. A bag of money will give you some extra points. All secondary weapons are found in candles also. The axe flies in an arc when thrown and costs one heart. The dagger throws three daggers straight ahead and costs one heart. The boomerang will go straight and come back to you and costs one heart. The holy water flies in an arc and causes a fire to spread on the floor when it breaks, and it costs three hearts to use. The stopwatch will freeze all enemies for a few seconds and costs five hearts. Whenever you pick up one of these weapons, the weapon you had before will be cast on the ground, and will remain there for a few seconds if you want to pick it back up. Everything that falls out of candles has a time limit, so if you don't grab it soon it will disappear. To avoid being thrown back into a pit or other object while fighting any enemy, duck when your character is hit. This will not work if a whip is being used, or when on a spinning gear (clock tower). This is very useful for fighting Dracula when he uses his huge double fire ball attacks.